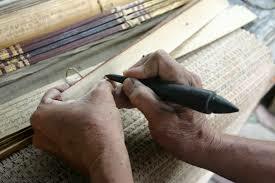 According to the nature of the instruments, the writing instruments are divided into three types. 1.The stylus is called as “Loha Kaṇṭaka” or “śalākā” in Sanskrit. It is a rod made up of iron with 10-30 cms. It taper with a sharp tip. The other end is made flat and sometimes decorated. The stylus can be made up of silver, gold, copper and brass. The tip is made with steel and sharpened time to time by oil. There are four varieties of fine point viz Chatra (umbrella), patra (leaf), Nala (tube) and Gaṇḍa (ball). The length of the above points vary as four, three, two and one aṅgulas. 2. The quill of porcupine or bamboo twig is used as pen to write on Bhūrja patra. It is called as Kuñca or vartikā. 3. Kuñcikā, Maṣi kuñcika, Tūli or Tūlikā or varti are brushes. Brushes are made of reeds, wood, iron and fibres and hairs. Varṇaka is a small colour stick usually used as a pencil. Chalk piece is termed as “Khaṭini” in Sanskrit. Manuscriptology brush, Manuscripts, material, stylus, writing. permalink.